The topic on „Argia“ is about the thirst for freedom. I only knew about the city of Pamplona in Basque Country, Spain that the Festival San Fermin is held annually. It’s the festival where people run away from the bulls. Meanwhile the city has a Symphonic Metal band called Diabulus in Musica, which can achieve a level like Nightwish and Within Temptation. The Spaniards issued its third album „Argia“ on April 11, 2014 after „The Wanderer“ and „Secrets“. Diabulus in Musica caught my attention for the first time when they performed at this year’s „Masters of Symphonic Metal“ festival at club Z7 in Pratteln, Switzerland. They performed well and gained more fans in Switzerland. „Argia“ was mixed and mastered by Jacob Hansen. The album gets distributed via Austrian record label Napalm Records. „El Resurrexit (Libera Me) “ introduces „Argia“ and „From the Embers“ is the first track. The production is amazin’ and makes „Argia“ an acoustic hearin’ pleasure. The song „Furia de Libertad“ is my favorite song on „Argia“. Singer Zuberoa Aznárez sings together with no one else than Sirenia singer Aylin Giménez. The Spanish influences come into „Furia de Libertad“. This gives the song a special touch. The topic on „Argia“ is about the thirst for freedom. The residents of Basque Country would like to be independent. However they haven’t received it and the Basque terror organisation ETA has tried to achieve this status with terror and violence. In the meantime the situation has changed and the ETA is disarmed and disbanded. „Argia“ also contains songs with Death Metal growls. This singin‘ style is part of „From the Embers“ and „Spoilt Vampire“. The fans have to decide if they like it or not. A particular song is „Encounteres at Chronos Maze“. Thomas Vikström is the male voice. He’s a Swedish singer, who has worked with famous bands like Therion and Candlemass. A great duet by Aznároa and Thomas. 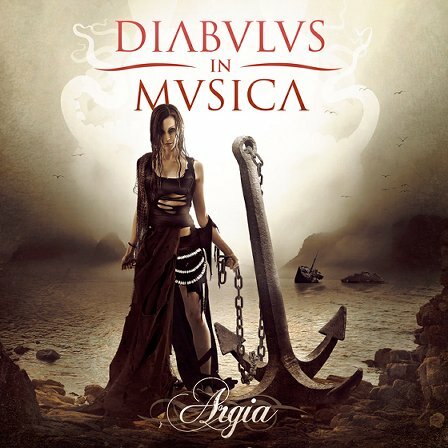 Fans of „Female Fronted Symphonic Metal“ should listen to „Argia“ and take the opportunity to watch Diabulus in Musica live, when the Spaniards perform in the neck of your woods. Thematisch geht es auf „Argia“ um den Durst nach Freiheit. Bisher wusste ich über die Stadt Pamplona im Baskenland, Spanien, dass dort das San Fermin Festival mit den Stieren stattfindet, welches Touristen aus aller Welt anlockt. Mittlerweile hat die Stadt mit Diabulus in Musica eine Symphonic Metal Band am Start, die es schaffen könnte, einen Bekanntheitsgrad wie Nightwish und Within Temptation zu erlangen. Mit „Argia“ veröffentlichten die Spanier am 11. April 2014 ihr drittes Album nach „The Wanderer“ und „Secrets“. Zum ersten Mal aufmerksam wurde ich auf Diabulus in Musica als sie beim diesjährigen „Masters of Symphonic Metal“ Festival im Club Z7 in Pratteln, Schweiz aufgetreten waren. Sie zeigten eine starke Darbietung und erweiterten dadurch ihre Fangemeinde in der Schweiz. „Argia“ wurde von Jacob Hansen abgemischt und gemastert. Das Album wird durch die österreichische Plattenfirma Napalm Records vertrieben. Durch „El Resurrexit (Libera Me)“ wird „Argia“ eingeläutet, ehe mit „From the Embers“ das erste Lied erklingt. Die Produktion überzeugt vollkommen und macht „Argia“ zu einem akkustischen Hörvergnügen. Mir gefällt auf „Argia“ das Lied „Furia de Libertad“ am besten. Hier singt Frontfrau Zuberoa Aznárez mit niemand geringerem als Sirenia Frontfrau Aylin Giménez. Bei „Furia de Libertad“ kommen spanische Einflüsse zur Geltung. Dadurch erhält das Lied eine ganz spezielle Note. Thematisch geht es auf „Argia“ um den Durst nach Freiheit, denn die Bewohner des Baskenlandes würden gerne unabhängig werden. Jedoch wird ihnen das verwehrt und in der Vergangenheit hatte die baskische Terrororganisation ETA versucht diesen Unabhängigkeitsdrang mit Terror und Gewalt durchzusetzen. Unterdessen hat sich die Situation entspannt und die ETA wurde 2011 entwaffnet und aufgelöst. „Argia“ beinhaltet auch Lieder mit Death Metal Gesang. Bei „From the Embers“ und „Spoilt Vampire“ kommt dieser Gesang zum Zug. Ob das gut oder schlecht ist, überlasse ich den Fans. Ein spezielles Lied ist „Encounters at Chronos Maze“. Hier tritt Thomas Vikström als männliche Stimme in Erscheinung. Er ist ein schwedischer Sänger, der mit bekannten Metal Bands wie Therion und Candlemass zusammengearbeitet hat. Ein grossartiges Duett, welches Sängerin Aznároa Zubarez und Thomas Vikström hier abliefern. Fans von „Female Fronted Symphonic Metal“ sollten sich „Argia“ anhören und die Gelegenheit wahrnehmen Diabulus in Musica live anzuschauen, falls die Spanier in eurer Nähe auftreten sollten. „Argia“ tiene temàticamente la sed de libertad. Sabía que la ciudad de Pamplona en el pais vasco de España tiene el festival San Fermin con los torros, que atrea turistas culturales de todo el mundo. Mientras tanto la ciudad tiene una banda de Symphonic Metal Diabulus in Musica que puede adquirir un grado de popularidad como Nightwish y Within Temptation. Los Españoles han publicado su tercero disco „Argia“ en el 11 de avril de 2014 después „The Wanderer“ y „Secrets“. Diabulus in Musica ha atraído mi atención para la primera vez en el festival „Masters of Symphonic Metal“ de este año en el club Z7 en Pratteln, Suiza. Ha convencido por un alto rendimiento y ha extendado su base de fans en Suiza. Jacob Hansen ha meczlado y masterizado „Argia“. La compaña discográfia de Napalm Records Austríaca distribuye el disco. „El Resurrexit (Libera Me) “ introduce „Argia“ ante la primera canción „From the Embers“ sone. La producción convence y escuchar „Argia“ es un placer. Me parece la canción mejor „Furia de Libertad“ que „Argia“. Cantante Zuberoa Aznárez canta con nada más y nada menos que por Ailyn Giménez, la cantante de la banda Sirena. Influencias españolas aparecen en „Furia de Libertad“. Así pues, la canción recibe un toque especial. „Argia“ tiene temàticamente la sed de libertad, porque los habitantes del pais vasco quieren estar independientemente. Sin embargo, no se oponen la libertad y la banda terrorista ETA ha trato opuestar la sed de libertad con terror y violencia en el pasado. Mientras tanto la situación es mejor y ETA ha disarmacido y disolvado en 2011. „Argia“ tiene canciónes con canto de Death Metal tambien. Canto de Death Metal aparece en „From the Embers“ y „Spoilt Vampire“. Para si sea bien o mal tienen que decidir los fans. Una canción special es „Encounters at Chronos Maze“. Aquí Thomas Vikström entra la escena como voz masculina. Él es un cantante sueco y ha colaborado con bandas conocidas que Therion y Candlemass. Un dueto magnífico de Zuberoa Aznárez y Thomas Vikström. Fans de „Female Fronted Symphonic Metal“ deben escuchar „Argia“ y aprovechar la oportunidad de ver Diabulus in Musica en caso los Españoles tocan cerca de usted.